India’s Most Popular Car Colors! 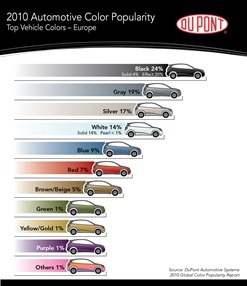 Any Guesses as to which is India’s most popular color choice for car buyers? If you said “White”, you are bang-on. 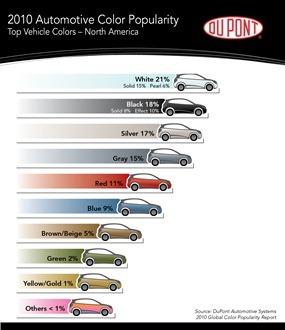 White is the most popular car color for Indians. 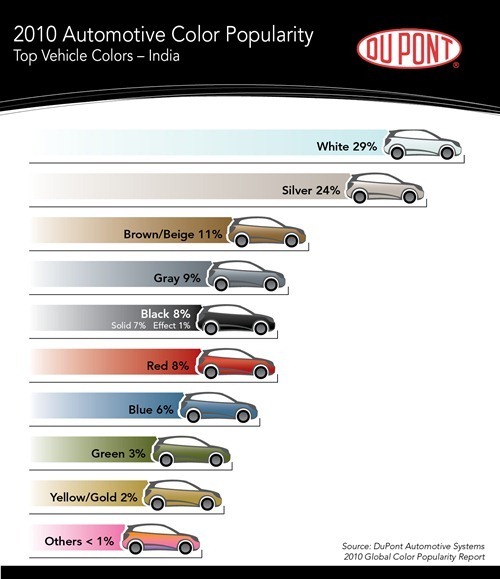 According to Dupont Automotive Color Popularity Report, more than half (53%) of Indian cars are either White (29%) or Silver (24%). Black don’t find much favour with Indian’s with only 8% of car owners having black colored cars. I also looked at popular car colors in different countries and region and it is interesting that car buyer choices differ by the region. While, India car buyers prefer White and Silver, 49% of Chinese car buyers choose either black (31%) or Gray (18%) color. 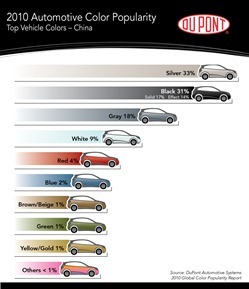 Though, Silver is still the most popular color with 33% Chinese in favour of it. In North America, White (21%) and Black (18%) are popular in nearly equal measures, while Red is favoured by 11% North Americans. Europeans on the other hand are not in favour of White, with Black (24%) and Gray (19%) being the most popular colors. What I can conclude from these car color findings is that, mostly local climate plays an important part in choosing the color of the car. Countries with cooler climates tend to go with darker colors, while tropical and warm regions tend to prefer white color vehicles. This though must be the obvious reason as darker colors tend to absorb sunlight (very much required in cooler countries), while lighter colors reflect it keeping the car cabin cooler in warmer regions. So, which is your favourite car color ? Interesting that Brown/Beige is at no 3. I thought it would be Red. Because that’s the default colour of Swift. I think 4 out of every 5 Swifts are red and that is a no 1 car in its segment I believe.